Out of stock. Click here to special order this item. 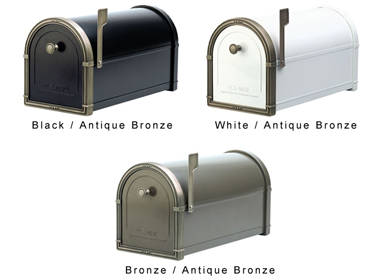 This version of the Coronado Mailbox line has accent pieces finished in antique copper. The body is finished in a durable powder coat available in black, white, sand and bronze. Assembly Hardware: Stainless steel hinges. Zinc plated assembly screws and nuts. 100% solid brass accent pieces (frame and knob). Accents are 100% die cast brass with sharp detail and deep relief, finished in antique nickel, antique copper, or polished brass. Body is fully powder coated 1.5 mm galvanized steel for extra long life.